On our fifth day in Poland, we continued with the righteous among the nations theme by visiting Oskar Schindler’s factory in Krakow that has been converted into a museum. 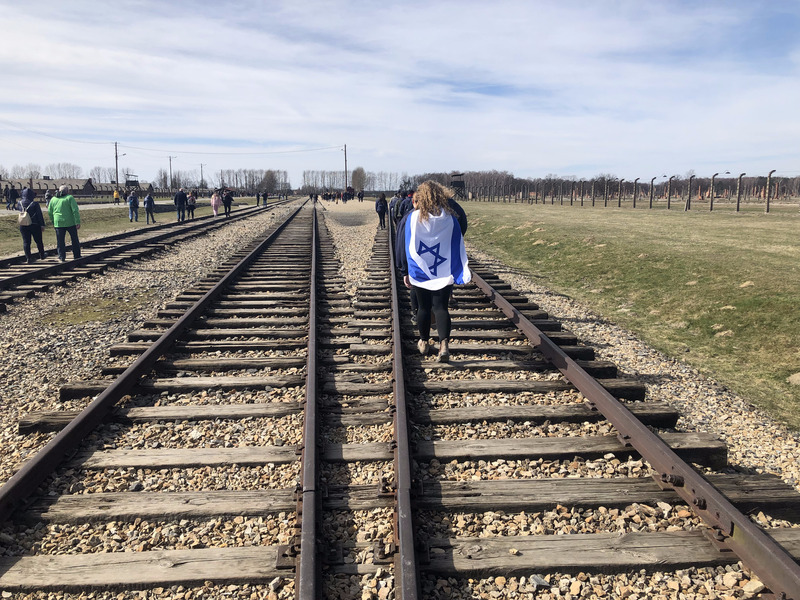 After discovering the strength and compassion some gentiles had for Jews during the Holocaust, we headed to Plaszow, a concentration camp where many of the Schindler Jews were saved. The concentration camp is all but destroyed. Here, we spoke about Israel and how the destruction of the Holocaust serves as a contrast to the subsequent rebuilding of Israel. After checking into our hotel, we experienced Kabbalat Shabbat in Krakow and had a very nice dinner. Our Shabbat morning began with a service in the only synagogue in Krakow that is still in use, followed by a walking tour of the Jewish quarter and all the synagogues that are no longer in use. After a great Shabbat lunch, we had the unique and humbling opportunity to host a 90 year old woman who is a righteous among the nations. We heard her family’s tumultuous story of saving the lives of 10 Jews. We were so thankful to hear from such a powerful and kind woman. As Shabbat went out, we prepared for the final concentration camp we would see on our trip: Auschwitz-Birkenau. As we entered Auschwitz I on our final morning in Poland, we were taken aback by how preserved the camp still is. 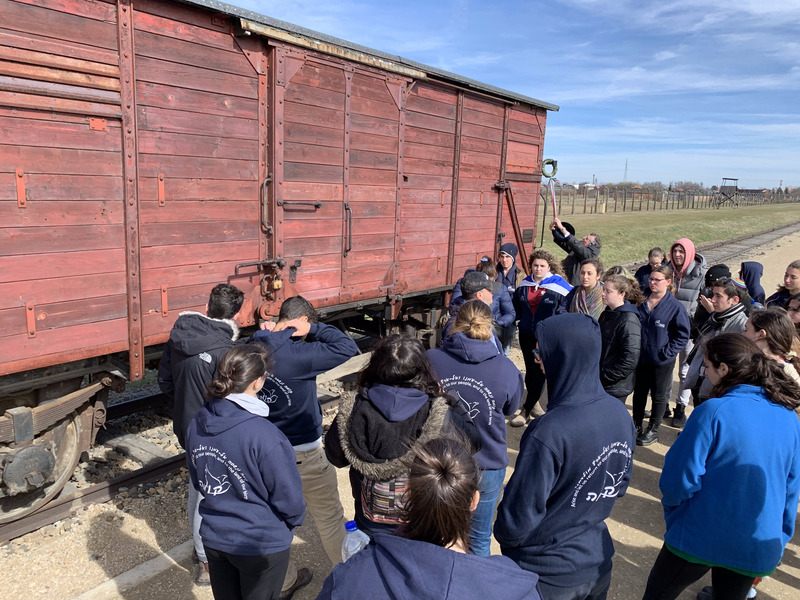 We walked into barracks that Jews had to stay in, and we saw huge cases full of personal possessions that the Nazis stole from the Jews as they entered the camp. We had the opportunity to read from the book of names of Jews that were murdered in the Holocaust that was put together by Yad Vashem and installed in a barrack. Some of the chanichim got to see all the information Yad Vashem has on their relatives who perished in the Holocaust. As a last stop before we left Auschwitz I, we stepped into a gas chamber. We held hands and said the “Shema“, the same prayer that was on the lips of the thousands of people who were murdered in that room. It was difficult for us to understand our own emotions as we were able to walk out of the gas chamber and out of Auschwitz I. 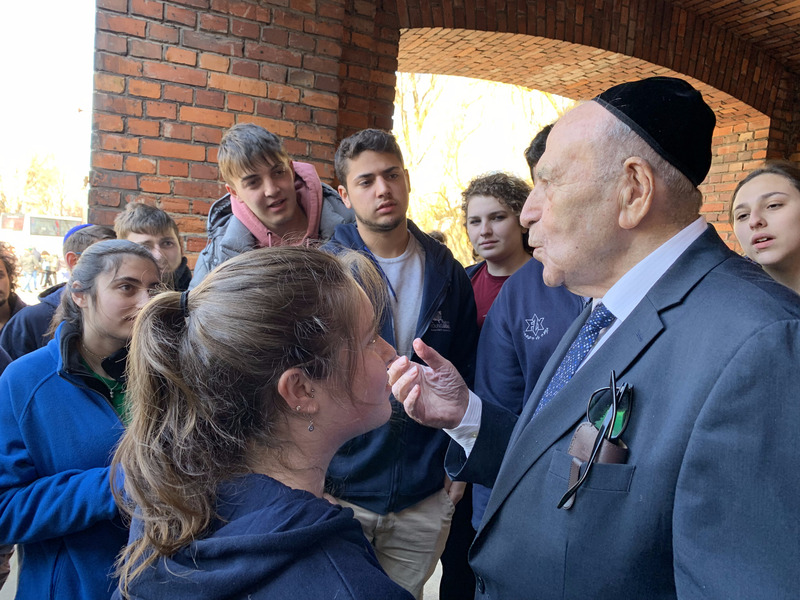 Our tour of Birkenau began with Rabbi Alan recounting to us that the only way people were able to survive in this camp was by having someone to survive with. As we walked into the camp, we linked arms and stood together. 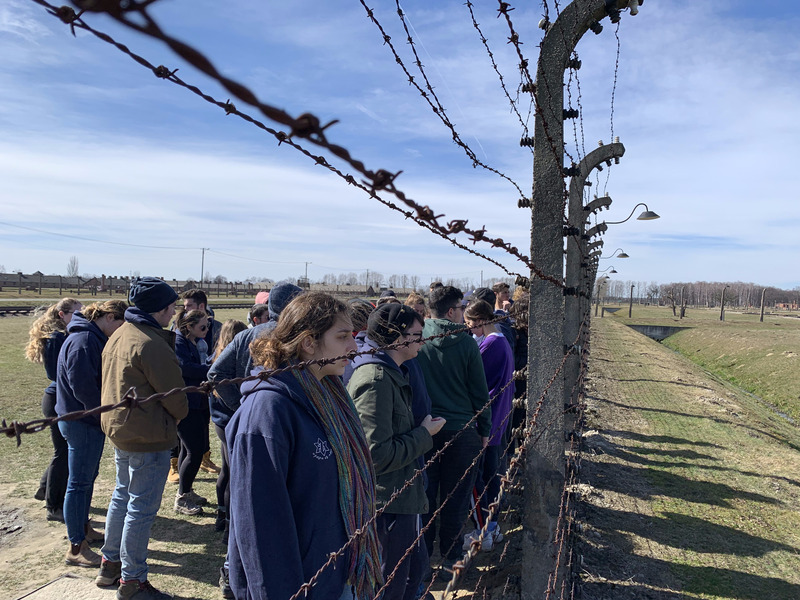 We did a tour of the entire camp, an expansive land filled with barracks, labor fields, and gas chambers. Along the way, several chanichim shared personal stories of their relatives who had either survived or perished in this place. Our final ceremony, run by Ori Shoffet, Joci Rodenstein, and Larissa Bernstein included a collection of poems written about Birkenau. We ended the ceremony with the message that in addition to never forgetting the Holocaust, in a more positive light, we should always remember what happened and what we saw and pass that memory onto future generations. We left the camp arm in arm singing “Oseh Shalom” as loudly as we could, and in one voice. As we waited in the Warsaw airport for our delayed flight, we met a couple of musicians from an Israeli group who had been on a similar journey as ours. They pulled out their violin and guitar respectively, and began to play Jewish and Israeli songs we all knew the words to. As we danced around the airport with a bunch of Jews we had never met, the feeling in the room was uniquely powerful. We were a group of Jews singing songs we’ve sung for centuries in a land where our people had been systematically murdered on our way back to the country we Jews can always call home. It was life-changing, to say the least. Tears of joy and astonishment were shed even before we boarded our plane back to the Holy Land. 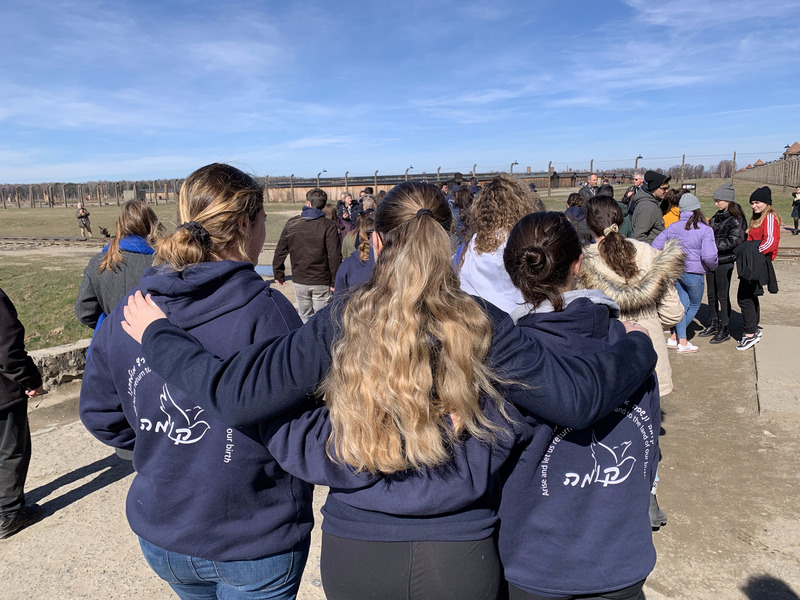 After we landed, we headed to the Kotel where we shared a couple last personal stories from the trip and sang a tearful “Hatikvah” as we stood in a circle around the flag of Israel. All the chanichim were incredibly mature and thoughtful throughout this process, and we’re grateful to have shared this experience with them.